A quaint, quintessentially California beach cottage, built by noted Cambria watercolor artist and printmaker, Jo Werts. Designed to take maximum advantage of light, it is replete with huge ocean view windows, and high, open-beam ceilings, giving it a light and airy feeling. It is simply but comfortably furnished with a King Size bed. It is decorated with some of Ms. Werts' works, and a number of other original prints. 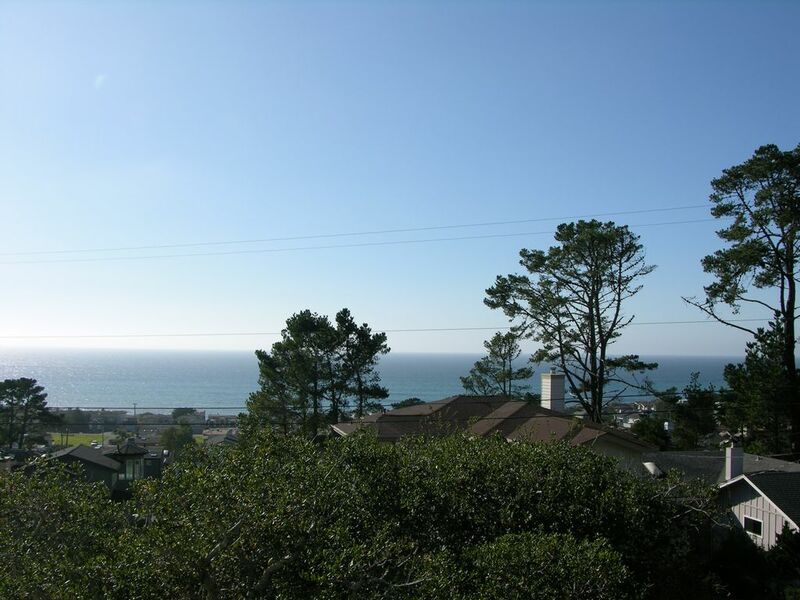 The house is located on a hill overlooking Cambria's Marine Terrace, and affords spectacular ocean views from nearly every room in the house. There is a deck off the master bedroom with beautiful, white-water ocean views, as well as a more private, protected deck and garden in the backyard area. A 2-3 minute walk to the ocean bluff hiking trails of the East-West Ranch Openspace, the Harvey St. Beach, Lampton State Park and Wedgewood Tidepools. Full bath is a glass enclosed tub/shower combo on upper level off the sleeping area. 2nd bathroom is a 1/2 bath powder room on entry level. 4 blocks from ocean. House located on a hill and view is over roofs of houses below. We have a land line with free long distance service in the event cell service might be spotty. Gas Fireplace is the heat source for the home. Additional 2 bar stools at counter overlooking living area. 2 flat screen TV. One in living room and one in bedroom. There is a lovely sitting space off the kitchen and also an ocean view deck off of the bedroom. The cottage is a short walk to the ocean & tide pools and the Fiscalini Ranch Preserve, which is a popular place for morning or late afternoon walks.